Effective partnership working between school and home to promote effective parental engagement has been shown to have a positive impact on raising attainment for young people. At Linwood High School we encourage parents to work with their child and with the school to help them achieve success throughout their school career. To help parents understand the changes to the National Qualifications, the National Parent Forum of Scotland have produced a series of "In a Nutshell" guides for subjects at different National levels. Knowing what your child is required to do for their chosen courses will help you to support them. 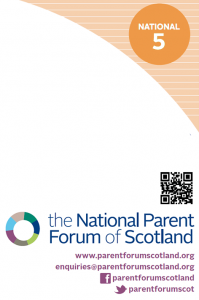 The aim of NPFS is to 'represent parents in pursuit of maximising every pupil's potential'. You can find more about them and their National 4 & 5 Nutshell guides on the links below. You can also follow our local NPFS rep for Renfrewshire on Twitter @NPFSRenfrew or contact via email.